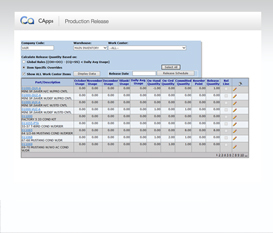 CApps is an end-to-end solution that comes with an array of modules and built-in features that are designed and can be tailored to meet any challenges for the manufacturing, fabrication or distribution industry that allow for simplified and efficient implementations of operational processes. 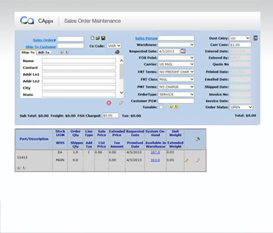 CApps has the ability to manage every aspect of your company's operational processes from: inventory control to work in process to final product shipment. It will help your company automate manual and inefficient processes while maintaining a high level overview of all aspects of your operation and data collected. When searching for a manufacturing or distribution solution, companies fear exorbitant costs associated with replacing their existing ERP or MRP system. 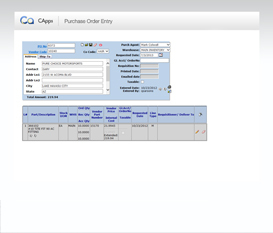 The good news is, out of the box; CApps is a web-based bolt-on application that can be integrated with your existing ERP or MRP system minimizing costs and risks without replacing your existing enterprise systems. To see more detailed application previews, please Sign In or Register for a FREE! account. © 2019 Coldwater Technology, Inc. All rights reserved. COLDWATER™, Q-SCAN™, B-METRICS™ and the Mountain Logo are proprietary trademarks of Coldwater. Unless noted to the contrary, all trademarks, copyrights, and other intellectual property on this site are owned by Coldwater or its affiliates. Information provided by Coldwater is for informational purposes only. Do you need more information? Have questions or concerns? Subscribe to receive email updates of new technologies to enhance your business operations. Please fill out the form below and a Coldwater Technology representative will contact you to schedule a free customized demo. If you’d like to speak to someone immediately, please call (469) 574-9914.